Some nights I fall asleep reading comics until the iPad glass hits me in the face. Man, I really hate going to bed. Imagine what might happen if the government removed your ability to sleep? What nightmares await you when the brain can’t rest? Will it unlock a power you didn’t know you had? The third issue of sleeper hit (pun intended) John Flood hits shelves this week from the waking mind of Justin Jordan (The Strange Talent of Luther Strode, Shadowman, Deep State). 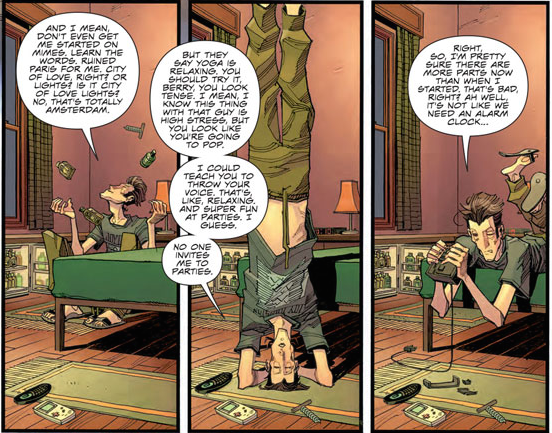 Justin took a few minutes away from his busy work and convention schedule to give us the skinny on his sleep deprived detective comic book over at BOOM!, available at your local store and digitally today. FOG! : Thanks for taking the time today between cons and your busy schedule. Your new book John Flood from BOOM! is keeping me up at night! What’s the skinny on this night owl? Is this your first book at BOOM!? What attracted you to this publisher for John Flood? Justin Jordan: John Flood is actually my second book at BOOM!, Deep State, with Ariela Kristantina and Ben Wilsonham, was the first. As to why BOOM! for John Flood? Well, it’s a weird book. So much so that I didn’t like the odds of us being able to successfully do it at Image. Successfully, here, meaning that everyone gets paid. But beyond making sure Jorge and Tamra weren’t working for nothing, this is also such a weird and complex book that I really needed editorial support to make the book I wanted to make, which I got at BOOM!. This would have been a different and, I think, not as good book elsewhere. I remember your amazing artist Jorge Coelho from Venom a year or so back. Did you seek him out? The style seems a really great fit for the story you are telling! I’ve known Jorge online for a while now, and we met a couple years back in person at NYCC. Likewise, Tamra and I have been trying to work together for some years now. It happened they ended up working together on the Sleepy Hollow books at BOOM!, and they were my first choice for the book. Which, happily, they agreed to do. They’re able to convey the kind of dream like fantasmagorical look I wanted for the book, and that art style is really, really critical to making the book what it is. Flood is a bit of a different kind of hero, a detective, but one that can see patterns in crimes mostly because he is in a fugue state from his government-issued insomnia. What happens to a writer that can’t sleep? 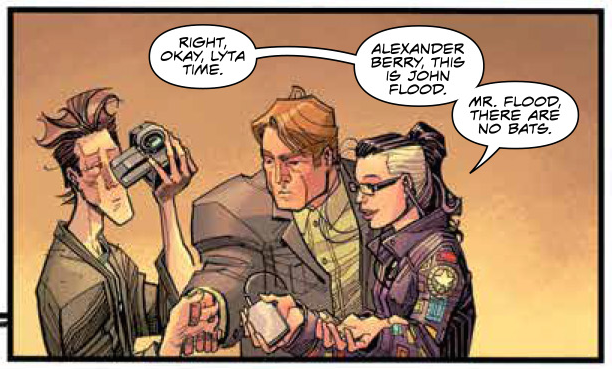 Why is Lyta giving her job as John Flood’s assistant to Alexander Berry? What makes that partnership so important to solving crimes or to keeping Flood somewhat sane? Lyta giving up her job is not…entirely voluntarily. That does get answered in the series, but the short answer is that Berry is a lot better at guaranteeing Flood’s physical safety. His mental safety, or the safety of those around him, maybe less so. But Flood needs someone to serve as sort of a reality guidepost for him, and a kind of moral compass, which is why he desperately needs Lyta and Berry. How did Flood get all of his money and his gigantic if ill-kempt house? Those are from grateful clients. Flood, himself, has very little need for money, but since he’s able to solve problems no one else can, he’s amassed a lot of people willing to do him favors. So he doesn’t actually own the mansion, so much as he’s allowed to stay there by who does own it. Sort of Magnum P.I. style. But that’s a story for another time. Flood can see patterns in the negative spaces of what is not there, perhaps a bit of a Doctor Who influence there. Is this more of a crime book or a psychedelic sci-fi detective story? Not to pigeon hole you to either of those categories of course! I wouldn’t call it sci-fi, myself. It has the one element – a man not needing to sleep, but I think that’s not so much a genre defining element. It’s a fairly classic detective story, albeit an odd one. You could conceivably have Holmes take on the case of the super-killer, although he’d approach it differently. So it’s more the style and tone that are different. But it’s definitely within the detective story genre. Very. very good. It’s one of the best reviewed books of my career, and readers seem to really dig it, judging by reactions online or at cons. What’s the weirdest thing you’ve done or eaten on a sleep deprived jag? I’ve seen people take up hobbies painting on heads of pins or complex puzzles. Do you have a cure for insomnia? Well, I did make the mistake of watching Fear and Loathing in Las Vegas, which meant I was seeing bats and obsessively checking and rechecking my door to see if it locks. Will John Flood ever get to take a nap or is it physically impossible after 10 years? No naps for Flood. His lack of sleep is permanent. The best he can do is figure out why someone did it to him. Thanks again for joining us, Justin! We look forward to more of John Flood! Anything else coming out soon you’d want to tease? Man, good question. I’ve got a new book from Aftershock coming soon, and Spread (Image) and Legacy of Luther Strode are still coming out. So….those?